Google announced their new Compute Engine pricing. 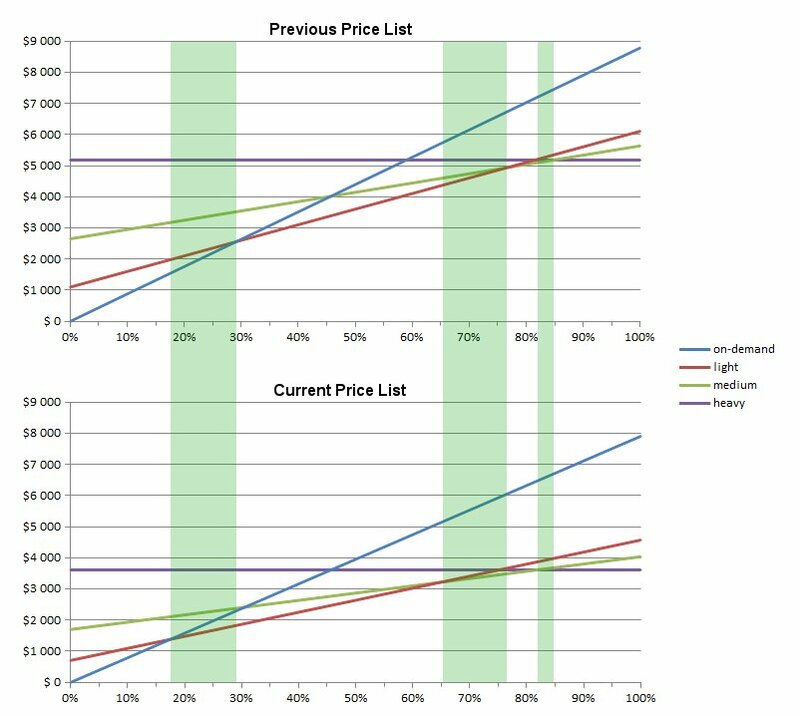 While virtually everybody is focusing on significant price reductions, more important is their new model of sustained use discounts. Seems innocent but this might be complete game changer in the market. Up until now, virtually everyone who planned to host application in any cloud had to make very basic decision – should I commit for long-term usage or go with on-demand servers. This could be reserved instances in case of AWS or longer period subscriptions in case of other providers. In either case, you had to think how you expect your future usage would look like. Therefore, while you had simplicity of consumption-based billing for on-demand prices, you still had to plan upfront to achieve greater cost optimization on expense of risk that predictions were wrong causing additional costs. This in turn was spoiling the perfect image of pay-what-you-use premise. The first change came from AWS when it introduced Reserved Instance Marketplace over a year ago. It enabled users to sell their reservations in case predictions turned out to be invalid. This definitely improved the situation but still the risk of finding buyer was on the client, letting alone the 12% fee and sadly limitation to US customers only. Later there were further improvements of moving reservations between availability zones as well as changing instance types of a reservation within the same family. It got even better but still not yet where we all wanted to be. 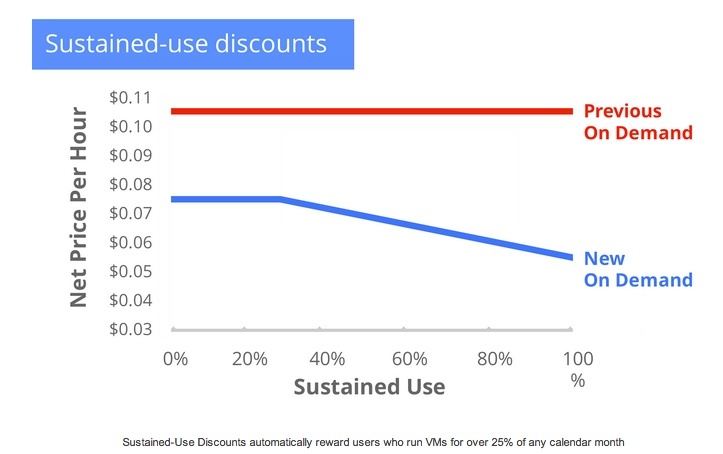 Google is the first one to make it no-brainer for customers but still encourage predictable workloads. You just use on-demand servers. However, as soon as your server is run 25% of the time, a discount is applied. Then further with 50% and 75%. So the closer you get to the permanent usage, the cheaper it gets. Without any planning. Just based on actual usage. Like a self-cost-optimization plan. 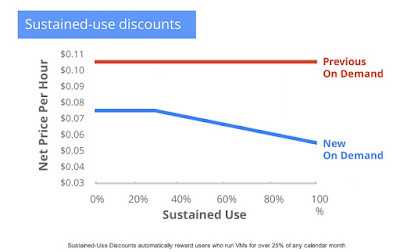 This is Google that takes the risk of usage predictability, not you. This is not so noticed but amazing step of even easier usage of cloud services, bringing cloud elasticity to completely new level. I’m extremely excited to see what will be the response of other cloud services. I hope it is going to settle new standard that others would follow, making things even simpler. Google Reader is gone now. Millions of frustrated users found their new home in Feedly, The Old Reader, Digg and more. The millions that could have become active part of the service that Google seems to care the most now – Google+. How? Obviously, very easy. So, what should have Google done? I guess you already know. If you could add RSS to circles, if you could automatically migrate all your Reader feeds to a RSS circle and read your favorite feeds directly in the Google Plus stream, would you do it? I would. I don’t care if I read my feeds in Reader or Google Plus. I just want that content. Once I started reading the Google Plus stream, quite likely I would start sharing and become active Google Plus user. I would but I will not. I guess substantial part of the Reader users would. Probably Google hoped to see the users changing their habits to the more modern, social ones. But seems like the Reader crowd are just old dogs who do not learn new tricks. Apparently, I am an old dog. Regardless, I’ve read only about various RSS services breaking down under unexpected gift from Google, never about huge shift to Plus. Google could have gained substantial part that Reader crowd to Google Plus. They could have had me looking into Google Plus many times every day. Instead, I feel left out without migration path, I’m now a user of a different RSS reader service and Google is where it was with its Plus service. Sorry Google. With the new Amazon Web Services region opened in Australia there were some comments on Twitter and even articles about higher prices than US. While apparently Australia is struggling with high services prices, the launch of the AWS region should be looked in a slightly wider context than comparison to US. 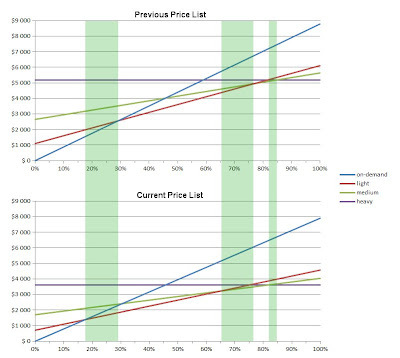 While prices in Australia are higher than US, it is somewhere in the middle for international AWS prices. EC2 and EBS prices are at the same level as Europe and Singapore, while Japan and Brazil and even US West (California) are more expensive. Transfer starts to be cheaper in Singapore only above 10TB, though here both US and EU are cheaper. S3 storage cost is at the level of US West (California), where only Brazil is more expensive. Overall Australian AWS prices are still in the middle of international AWS regions, while definitely not at the US East level. 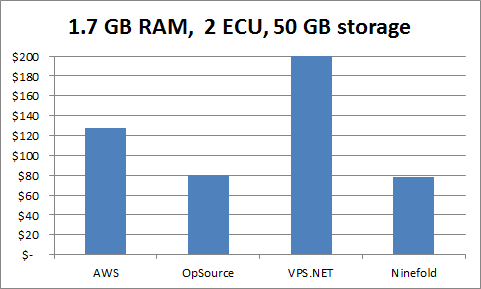 But what is probably more important is how AWS compares to other cloud providers in Australia. Australia unfortunately does not have a huge number cloud providers available. By far the most known Australian provider is Ninefold, but there also others available – OpSource and VPS.NET has their international locations in Australia. There are also other local providers available, like OrionVM or CloudPeople. Unfortunately the last two are not yet supported by Cloudorado, so I’ll focus on current four. 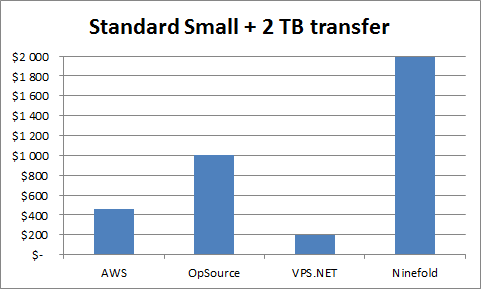 To check how does AWS compare, we will make some sample configurations to check how they compare between providers. It must be said that the prices of AWS in Australia are in general very competitive. 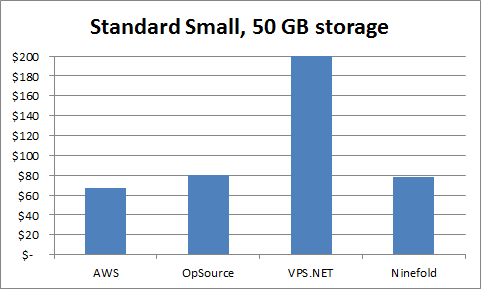 When you play around, AWS is often at the top of the list. It is much, much more often than for other regions. But in all regions the same is true – when considering cloud provider, you should carefully compare cloud computing providers. Depending on your specific requirements like resource ratio, transfer or acceptable commitment duration completely different provider might be best choice. Cloudorado make it very easy to perform such individual comparisons.